This summer OXY® launched the 28 Day Challenge and is the first over-the-counter brand acne product to offer a free iOS and Android smartphone app to help teens clear their skin through a tailored regimen. 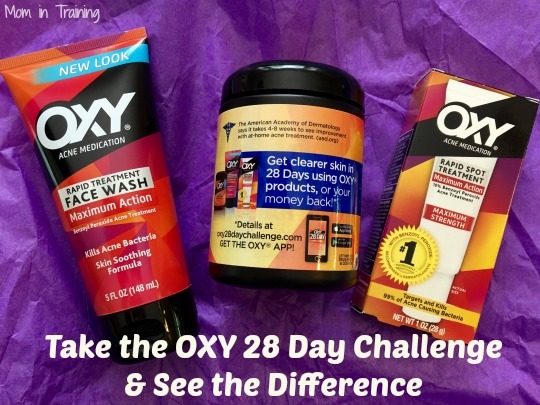 The OXY 28 Day Challenge is the perfect way to take action and get a step ahead of acne to help teens looks and feel there best as they get ready to head back to school this summer. I thought this was really cool because I'm one of those people that always has good intentions, but seems to "forget" a lot. Since I'm able to have an app that reminds me to do my daily regimen it's been so much easier to stay on track with using the OXY® products. Sometimes we all need that little added nudge to keep a good thing going! OXY® has been a trusted skin care brand for over 40 years and the OXY® 28 Day Challenge takes an open and honest approach the helping teens clear acne-prone skin. While many skin care brands unrealistically promise fast and easy results, OXY® knows that truly effective acne treatment is an ongoing, regimented process that takes time. In fact, dermatologists agree that it can typically take up to 4 weeks using acne treatments to effectively clear skin. The 28 Day Challenge promises clearer skin guaranteed or your money back. This might be good for my daughter who still suffers from occasional acne. Sounds like great products!